iMovie is a great free movie making software for Mac with tons of advanced features. You may have some home videos and enjoy making movies with iMovie. After finished the movie editing, you have multiple ways to share your masterpiece: save to computer, transfer to iTunes, share to YouTube, Facebook, MobileMe Gallery, etc. And of course, burn the iMovie project to DVD for better video preservation! Want to burn iMovie to DVD so that you can watch the home movies on DVD player or TV with family and friends? Look no further! Here you'll know how to get it done easily. To burn DVD from iMovie projects, you should first export iMovie project as videos files by choosing "Share" > "Export Movie". When the videos files are generated, get a Mac DVD burning software to burn the edited video files. 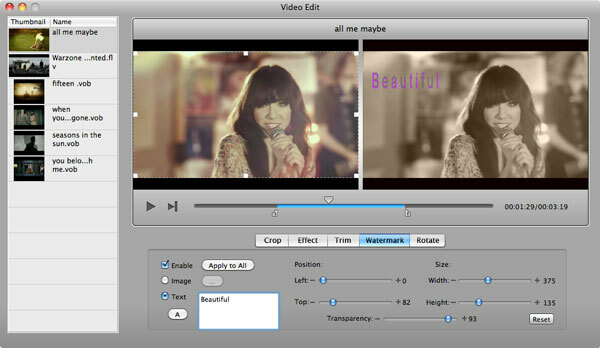 Here Aimersoft DVD Creator for Mac is strongly recommended to help you burn DVD from iMovie projects. With it, you can successfully burn iMovie project to DVD disc with super fast speed and high output quality. In addition to iMovie files, it can burn video in almost all regular formats like AVI, FLV, MP4, WMV, MOV, MKV, VOB, etc. to DVD. Moreover, the built-in free video editor and DVD menu templates let you personalize your DVD like a pro. Now download it and follow the steps below to burn your iMovie 08/09/11 project to DVD on Mac OS X (including Yosemite, Mountain Lion and Mavericks) effortlessly. By the way, if you use Windows computer, you can go to Aimersoft DVD Creator. After you finished the movie making in iMovie, select the movie project you want to export and click "Share" from the main menu and choose "Export Movie" from the drop-down menu to export iMovie project to video for burning. Run Aimersoft DVD Creator for Mac and click "+" to import the exported iMovie video files or add media files from iPhoto, iTunes, etc. directly and quickly with one click. After the files are loaded, you can rearrange the file list with the up-down arrows. To personalize your DVD files, you can edit iMovie videos or slideshows as well by clicking the "Edit" button. For video files, you can crop the frame size, trim into several clips, append effects, add picture/text watermark, rotate, etc. as the below picture shows. Lots of free static and dynamic DVD menu templates are provided for your choice. You can select the one you like and customize it with your favorite photos, music, frames, buttons, etc. If you don't want the DVD menu, you can simply choose "No Menu". At last, click the "Burn" button on the main interface to open the "Burn" window. Insert the blank writable DVD disc to your Mac and choose DVD Disc, then click "Save" to start burning and saving your videos to DVD.